Then pay your debt by silence. In the audience for the first theatrical performance of Lady Windermere’s Fan on 20 February, 1892, were the playwright’s wife, cultural luminaries such as novelist Henry James, the most ‘brilliant’ members of high society, and a young clerk Oscar Wilde would bed that night (2). I resurrect this musty gossip to show how, in life as well as in his art, Wilde contrived to flatter an elitist audience (3) while cocking the most outrageous snooks; how Wilde was acutely conscious of his audience, their knowledge, prejudices and expectations, when writing and staging his works; and how, by blurring theatre and ‘real life’, Wilde analysed a culture whose ‘natural’, narrow codes of morality and manners were merely theatrical façades masking hypocrisy, brutality and emotional repression. There is a moral to Wilde’s play, but it is neither the conservative one of popular melodrama, nor the elevating message of great Victorian literature – to survive in a corrupt society, it is important to know how to play the game, to lie and conceal, to adopt roles that mask true feeling. True feeling can only result in bad moves and disqualification – a social lesson Mrs. Erlynne has bitterly learned. Mrs. Erlynne (Irene Rich) has returned to London despised as a ‘loose’ woman by polite society, no longer able to afford her extravagant lifestyle. She reveals herself to Lord Windermere (Bert Lytell) as the mother of his beautiful, naïve young wife (May McAvoy), whom she abandoned as a child to pursue an affair that ruined her socially. When Lady Windermere thinks her husband is having an affair with Mrs. Erlynne, she flees to the rooms of Lord Darlington (Ronald Colman), a dandy long pestering her with his attentions. She is followed by Mrs. Erlynne, determined to stop her daughter repeating the error she once made. But before they can leave, Windermere, Darlington, Mrs. Erlynne’s fiancé Lord Augustus (Edward Martindel) and assorted males arrive for one last tipple. If Lady Windermere is found in a bachelor’s apartment, she would be socially dishonoured. Ernst Lubitsch is faithful to Wilde’s original, retaining its four-act structure (adding, as a kind of prologue, the back-story alluded to in the play’s dialogue), and its primary locations, opening out just once for a trip to the races – a sequence that contains the film’s most flamboyant visual coups, most notably Mrs. Erlynne’s flight from a hostile aristocratic crowd (disapproving dowagers creaking like automatons; an army of black-hatted and -caped young men framed from behind like a Victorian Magritte), her sleek figure tiny against a giant sign pointing “EXIT”. Part of the famously indefinable Lubitsch touch depends on the director controlling the dramatic information so that the audience always sees more than any one character. Information, its dissemination, interception and manipulation, is often the motor of his films, usually made physical in the form of notes, letters, cards and invitations. This information is misread by a “pattern of glances [leading] to false conclusions”, notwithstanding a supply of visual ‘aids’ including windows and their reflections, monocles, mirrors and binoculars (4). 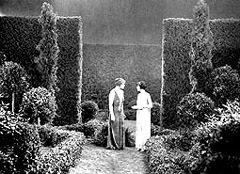 The audience is encouraged to ‘read’ more clearly, but Lubitsch lures it into complacent superiority only to undercut it – as the plot reaches its catastrophe, he withholds information, especially in the grove sequence, a Shakespearean green space planted with misunderstandings (5), where the activity of four characters is blocked and confused by framing and décor. We are forced to fill in these gaps based on previous information, to acknowledge desires, motivations and mental possibilities we may not have been open to before. Lubitsch elaborates on Wilde’s insight into life’s role-playing by literally staging the action – characters are frequently framed against curtains, as if performing before a proscenium arch; or making exits and surprise entrances through huge doors like wings; or looking down on action from windows as if from a box. The movement of characters is often ostentatiously theatrical, framed in static long shots; they manipulate the space themselves for theatrical ‘effect’, such as the nook in Mrs. Erlynne’s study where she seduces Lord Augustus. Much has been made of Lubitsch’s breaking up of deep interior space by fixed, “inobvious” camera angles (6), patterns of repetition, use of off-screen space and rhythmic editing (one can note the influence on an early fan, Yasujiro Ozu, another chronicler of limited social groups) (7). Less celebrated is Lubitsch’s manipulation of time. This is an adjunct to his use of space and the three shot-sizes that dominate his films – long shots that situate and sometimes dwarf characters in their surroundings; mid-shots that reveal characters as they appear to us or to others, emphasising “nuances of gestures” (8) and looks (especially, slow, dawning epiphanies), but also dehumanising tableaux that obscure faces and individualism; and close-ups, usually of objects or fragments of bodies, that euphemise or displace the (often unconscious) desires that drive these social beings, or the reduction of those desires to commodification and possession. The interplay of these shots and their meanings creates a deceleration of the action, from narrative and social time, to a kind of personal, emotional, psychological time, closer to the way people feel and think, and similar in a sense to that theorised by Bergson and fictionalised by Proust and Woolf. It is this generosity to his characters and their inner lives – one shared by Wilde, but here expressed as pure cinema – that gives Lubitsch’s sophisticated comedies their “poignant sadness” (9). The affinities between Wilde and Lubitsch are so obvious – they were both master comic stylists, purveyors of verbal facility and sexual allusion, and frequently accused of frivolity (10); both subjected middle-brow genres featuring the upper-classes (comedy of manners, operetta, farce, melodrama) to the rigours of modernity; both exercised such despotic authorial control they created forms named after them; both insisted on the importance of visual expression (costumes, colour, décor, movement, composition) as subtext to what is said in words – that it is easy to overlook their profound differences. For instance, what was a period piece for Lubitsch was urgently contemporary for Wilde – his own life story would show how much is at stake for his heroines as they risk social repudiation, an urgency diminished in the sexually liberated Jazz Age. If Lubitsch’s film is known today, it is probably for the “mad stunt” (11) of taking a work by one of literature’s most celebrated wordsmiths, and making it silent, without even the crutch of Wildean wit in the intertitles. It has even been suggested that Lubitsch improved on the original, adding a psychological richness that hadn’t been there (12). It is true that Mrs. Erlynne – who is a magnificent force in Wilde, and whose off-stage difficulties must be implied – is more fully elaborated in Lubitsch: we see her agonising over debts, regretting the underhand means she must employ to pay them; or tantalisingly admiring the daughter she can never acknowledge. Her most extraordinary scene is at Lady Windermere’s birthday, where, through composition and Irene Rich’s acting, the character’s emotional vulnerability is figured in her physical smallness in a huge-ceilinged space; she enters uninvited and unwelcome, having been humiliated by servants, an ordeal Wilde’s heroine sails through splendidly. It is also true that Lubitsch’s Lady Windermere is a more complex figure than Wilde’s naïve moral intransigent – she fully understands the meaning of Darlington’s overtures, and is unsure whether she can (or wants to) resist him; she is a woman treated as a child by her husband, left alone playing games (like setting dinner parties for real-life dolls), sopped with trinkets, but constantly denied emotional warmth. Both inhabit separate rooms, each introduced dealing with deception, whereas Wilde’s character is blindly idealistic. This boxing off of a married couple is brilliantly developed in the series of close-ups that separate the pair sitting together in his study as Lady Windermere confronts her husband with the supposed evidence of his infidelity. But ‘psychological depth’ is too often seen as the ne plus ultra of artistic achievement, to the exclusion of many other, equally valid approaches. Wilde’s Fan is only partly a psychological study – it is as much an analysis of how people and their private lives operate within their culture (13). Language, attitudes, morals, characters, stereotypes and situations in the play are taken from the stock social and cultural forms of the day, and turned against that society and culture, rather as Nicholas Ray uses the visual language of advertising in Bigger than Life (1956). When Lady Erlynne implores her daughter to “pay your debt by silence”, she is reminding her that what seems to be personal utterance is compromised by social meaning. Lubitsch, aiming for a mass audience rather than Wilde’s knowing élite, cannot rely on a similar, shared culture; but it is an achievement to catch some of this critique, especially in the racecourse section – the gelatin-silver glimmer pocked with sinister patches of black, individuals reduced to forms and signs, society grouped and functioning as an assembly line, the outsider Mrs. Erlynne, cornered like an exotic bird, constructed as ‘bad’ in the gaze of this social panopticon. The real difference between these two great artists may be a matter of history. There is, as I mentioned above, a cynical moral to Wilde’s play, but one that has an implied and progressive corollary – the need, not to accept and adapt to the status quo, but for change: Wilde was not just (for the late-nineteenth century) a sexual deviant, but a socialist and an Irish nationalist. Lubitsch, in Germany during the Great War and its chaotic aftermath, had seen change, the very destruction of a culture Wilde had called for, but couldn’t be quite so sanguine about its results. Richard Ellmann has shown how the close of Wilde’s Fan disrupts the rules of comedy by substituting concealment and fragility for revelation and restoration (14), just as Lubitsch’s films are characterised by “no ending, no limits, openness” (15). This openness may signal potential and maturity; for Lubitsch too, but also, perhaps, wariness and regret. Oscar Wilde, The Importance of Being Earnest and Other Plays, London, Penguin, 2000, p. 61. Richard Ellmann, Oscar Wilde, London, Penguin, 1988, pp. 344–345. The play was performed by “a company that catered specifically for upper-class tastes, since their venue was situated in the heart of clubland, close to Mayfair, Belgravia, the court and parliament.” Richard Allen Cave, “Notes to Lady Windermere’s Fan” in Wilde, p. 364. David Bordwell, “The Silent Era” in Geoff Andrew (ed. ), Film: The Critic’s Choice, London, Aurum, 2001, p. 40. Lubitsch began his career as an actor for Max Reinhardt, who would later direct the famous Mickey Rooney–James Cagney version of Shakespeare’s A Midsummer Night’s Dream in Hollywood (1935). Reinhardt, incidentally, staged some innovative and influential adaptations of Wilde’s plays, most notably Salomé in 1902. Edmund Wilson quoted in Herman G. Weinberg, The Lubitsch Touch: A Critical Study, New York, Dover, 1977, p. 88. David Bordwell, Ozu and the Poetics of Cinema, Princeton, Princeton University Press, 1988, p. 152. Georges Sadoul quoted in Weinberg, p. 88. Andrew Sarris, “Ernst Lubitsch: American Period” in Richard Roud (ed. ), Cinema: A Critical Dictionary – Volume 2: Kinugasa to Zanussi, London, Secker and Warburg, 1980, p. 643. Henry James dismissed Fan as “infantine” (Ellmann, p. 345); Harry Marshall (in 2004!) says of Lubitsch, “If only he had used those massive gifts to actually say something!”, Harry’s Stuff. James Harvey, Romantic Comedy in Hollywood: From Lubitsch to Sturges, New York, Da Capo Press, 1998, p. 7. See Cave, “Introduction”, Wilde, p. xxi. Enno Patalas, “Ernst Lubitsch: German Period”, in Sarris, p. 643.